Rated PG-13 for thematic elements and brief strong language. Now Trevorrow, working from a 19-years-in the-making script by Greg Hurwitz, has returned to the indie roots of his debut, "Safety Not Guaranteed." Don’t let the autumnal small-town atmosphere, friendly local diner and picket-fence neighborhoods fool you. This seemingly sleepy burg harbors a gun shop where simply dropping the name “Dominic” and flashing a sizable stack of cash can buy you a top-of-the-line assault rifle. The bullies are out there and, according to our 11-year-old hero, they must be stopped at any cost. That the juveniles in the cast are fully capable of carrying much of the emotional weight of this amiably uneven yet thoroughly manipulative tale is a great relief and often a source of joy to watch early on. Let’s start with Jaeden Lieberher (“St. Vincent,” “Midnight Special”) as Henry, whose off-the-charts IQ is matched by his Mother Teresa levels of empathy and concern for others. A know-it-all with a big heart could come off as too good to be true and more than a little annoying. But humble Henry is grounded by the fact that he prefers to go to a regular school with average kids and doesn’t have a braggy bone in his body. Not even when he is on the phone with a stockbroker while adjusting his family’s portfolio for maximum gains does he puff his wan chest. The production design has saddled this gifted lad with a steampunk aesthetic that defines both the bedroom he shares with his devoted eight-year-old brother Peter (Jacob Tremblay, proving his terrific work in “Room” was no fluke) and the tree house that serves as a kind of laboratory, whose walls are plastered with scribbled formulations and writings alongside Rube Goldberg-style inventions. Somber Lieberher and sweet Tremblay make for a credible pair of siblings who have each other’s back at all times and stay in touch via walkie-talkies even if they are mere feet away. Dad is so out of the picture, he’s not mentioned. Instead, divorced mother Susan (Naomi Watts in one of her increasingly frequent matriarch roles) dotes on her sons but is beset with self-doubt that prevents her from achieving her dream of becoming a storybook writer and illustrator. Instead, she works as a waitress, drives an old Volvo station wagon and takes out her frustrations by playing a violent video game when she’s not drinking herself silly with co-worker Sheila (a tart-tongued Sarah Silverman, whose tacky wardrobe is rightfully labeled “fashion roadkill” by Henry). There are indicators that Henry has more on his mind than reminding his mother to open the mail and pay the bills. For one, he can see into the bedroom of Christina, the pretty yet ever more withdrawn mother-less ballerina next door (Maddie Ziegler of Sia’s “Chandelier” video fame). He notices her stepdad (Dean Norris), who just happens to be the police commissioner, regularly pays her visits at night and suspects she is being abused. Despite his calling the authorities, no one has checked out what is going on. Then there are Henry’s lingering headaches, a condition that he has mostly kept to himself. That is a sure movie sign that someone is not going make it to the end credits. But Henry, as is his way, has left behind a carefully laid-out plan in a notebook and on tape for his mother to use to hunt down Christina’s stepfather if necessary. 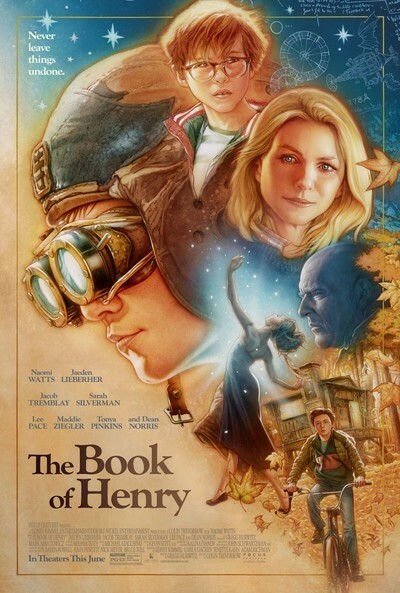 And, suddenly, “The Book of Henry” turns into a not very believable thriller, complete with a ticking clock and a talent show. Somehow, what turns out to be a nerve-wracking yet supposedly enlightening experience causes Susan to take more responsibility for her life and to face challenges head on. Plus, Henry’s cute doctor (Lee Pace) has developed a crush on her. Nothing awkward about that. For much of the film, I focused on the young actors (even Ziegler shows signs of having performing chops beyond her dance skills) and savored the few moments of dry humor—such as when Henry describes his own diagnosis in great detail and in complex medical terms to his shocked brain surgeon. But every book needs an editor, and there really is no upside in threatening to turn Watts into a mommy assassin. That doesn’t just make Henry look stupid, but his movie, too.